Redefining website and e-commerce business solutions. 3003 Online helps you grow your business with a web presence that STANDS OUT. We’re a web development and support team that always stands by our clients. Technology is ever so changing, we are ever so ready. Responsive Website Development is a key factor for today's trends. View this site on your desktop, iPad / tablet, or your mobile. We love to plan comprehensively. We’re perfectionists. We take extra care to plan, build and quality assure your website or web application. Office in Sri Lanka, Services Worldwide. Our portfolio of clients spans across the globe, from established companies to new startups. Our utmost strength is strong communication so that our clients are always in the loop. Building modern and easy to use websites under an Outsourcing Business Model. Build an e-commerce website designed to your business requirements. With a solid background in luxury e-commerce development, we help you reach and appeal to customers. Build your website to perfection inside and out. Your website will be have optimum functionality for being classed as a highly usable and fast tool to achieve your company's goal. 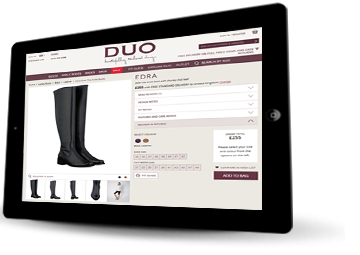 DUO, luxury footwear / fashion e-commerce retailer in the UK, with global sales and sub-sites for the USA, Germany, Netherlands, and France. For over 10 years, we have catered to all DUO's website development demands in line with DUO's business growth online. 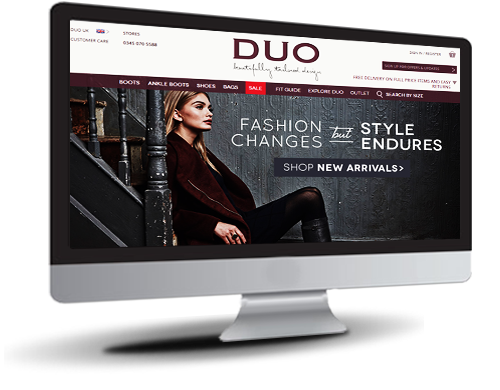 We provide DUO with a highly functional e-commerce website. Our dedicated team of developers are continually in contact with DUO for both web support and upgrades for their evolving web technology requirements.